BankWork$ is improving lives, one graduate at a time! For the first time in her life, Stacy feels truly secure. She has a good, predictable job, financial security, and a stable home for her children. But things haven’t always been so optimistic for her. As her home life unraveled, Stacy’s grades began to fall, and she felt emotionally drained. Overwhelmed, she dropped out of high school. She struggled with poverty and homelessness during one of the most challenging times in her life. With a three-year-old to care for and few professional skills, finding a stable job was exceptionally difficult. Stacy worked a few minimum wage jobs, but the cost of childcare was more that she earned. 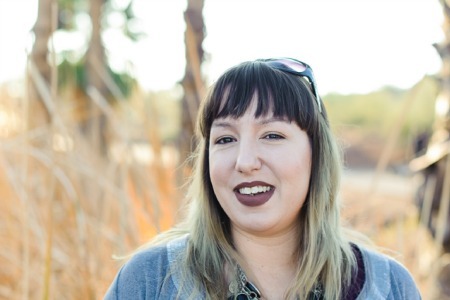 Stacy was without a reliable job solution until she learned of BankWork$, a program at Arizona Women’s Education and Employment (AWEE). BankWork$ provides comprehensive skills training to help individuals secure a job in the finance sector. Students delve deep into business etiquette, banking regulations, cash handling, and interview preparation. “When I heard of the program, I knew I had to enroll. I wanted to provide for my family, and I knew BankWork$ would give me the step up I needed to do that.” Stacy graduated as one of the top-performing students in the class. Immediately following graduation, Stacy was recruited by Wells Fargo, a BankWork$ program sponsor. “I’ve been employed with Wells Fargo now for over a year. Thanks to BankWork$, I have already gotten a promotion,” said Stacy. By helping Stacy create a better tomorrow for herself, you also helped give her children a stable future. You are creating lifelong impact for future generations. Thank you!